If your dog is choking, you'll need to get him to a veterinarian ASAP. However, you may find yourself in a situation where you have to act fast before you can reach a vet. If your dog is choking but still breathing, he will eventually become unconscious if he continues unaided. While these signs indicate a dog may be choking, they also can be symptoms of other problems. Barton C. Huber, DVM, from Animal Medical Center of Corona, says, "In my 31 years of doing this, I have rarely seen a dog that truly has something stuck in its throat. Most of the time it ends up being kennel cough (or some other infection) or a primary heart or lung problem." Regardless, if you see your dog displaying any of these symptoms, Dr. Huber says, "Bottom line - get the dog to a vet ASAP!" Dr. Huber says if your dog needs help immediately, the first thing to do is look to see "if the obstruction is visible." "Remember that a panicking dog may bite, even if not on purpose," he cautions. You should do what you can to protect yourself from a potential bite, but absolutely do not put a muzzle on. Having a second person there to restrain the dog helps, but if you are by yourself, you will need to get a hold of the dog's snout with both hands. Hold the top of the dog's snout with your hand and his lower jaw with your other hand. One way to minimize the chance of being bitten is to use the tips of your fingers to push the dog's "lips" (found around his muzzle) so that they cover his teeth. Keep in mind though, there is a strong chance you may end up being bitten during the process. 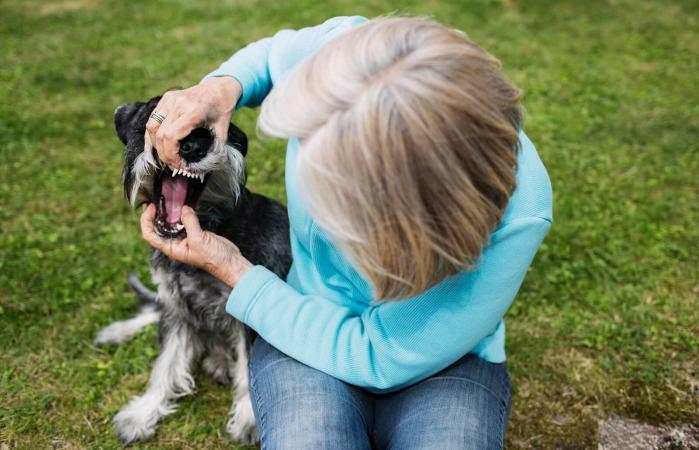 Slowly pull the dog's mouth open with both hands and see if there is an obvious obstruction. If you are not alone, having someone holding a flashlight over the dog's muzzle can help. If you can see an object, Dr. Huber recommends "grabbing, or scooping it out with fingers, if possible." Be very careful to not push the object in further. Many websites suggest using an object to pull or move the obstruction out, such as a fork, spoon, or tweezers. Dr. Huber advises against this, "as they could grab the tissue and make things worse. You don't want to end up pushing it further in, whether stuck in the pharynx (back of mouth), esophagus or trachea. You could do more damage than good." 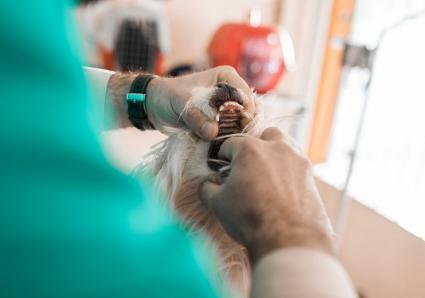 Even if you remove the object successfully, you should bring your dog to a veterinarian right away to make sure the dog's mouth, throat or esophagus is not damaged. If you can't see an obstruction when you open your dog's mouth, you can try the canine version of the Heimlich Maneuver. The steps differ based on the size of your dog. You will also need to adjust your position based on the type of dog. Says Dr. Huber, "Different body shapes have different techniques (English Bulldog versus Greyhound) so there is no 'universal' technique." He says in general, "The idea is to create enough pressure in the body to forcefully blow out whatever is stuck in the dog's airway." To start, you will need to be able to pick your dog up. Hold him upside down so that his rear end is vertically above his head. Support him by keeping your arms under his belly closer to the back of his body. As you hold him, swing him from side to side very gently. The swinging arc does not need to be wide, just a few inches or less. You can also shake them up and down rather than swaying. Hold your dog in this position for about 30 seconds. If your dog continues choking, move on to the next step. For small dogs that are still choking after the initial step, as well as for medium and large size dogs, lay the dog down on its side on the ground. It needs to be a hard surface so avoid laying him on a bed or pillow. Lift the dog's back end up and place something underneath so that the dog's head is lower than his rear. You can use whatever is handy - a pillow or a rolled-up towel or piece of clothing. Support the dog by placing a hand on his back. Using your other hand, place it on the dog's rib cage area and press into the ribs while moving your hand toward the front of the dog. Picture visually moving an object from the dog's abdomen up through the esophagus to get an idea of the direction you want your hands to move. You should do this maneuver no more than five times. Depending on the size of the dog, you may need to use both hands to do the maneuver. Another method for medium to larger dogs can be done with the dog standing up, assuming your dog is still able to. Bending over your dog from behind, place both of your arms underneath your dog's belly. You can also lift his back legs up, so he is in a wheelbarrow position, but for very large dogs you may not have the strength to lift him. Holding both hands together into a large fist, push up into the dog's abdomen while moving up toward the dog's head. You can also try pressing hard in between the dog's shoulder blades with the palm of your handle quickly for 4 to 5 times. This possibly can move the object enough that the dog can spit it out. Remember that after you try the Heimlich maneuver, you will need to bring your dog to the veterinarian as soon as possible, even if the dog is no longer choking. Knowing basic canine first aid, including how to do the Heimlich maneuver on a dog, can someday save your canine friend's life. If you have a dog that is prone to swallowing objects, make sure you "puppy proof" your house and remove access to anything dangerous such as small toys, plastic items, and even certain dog chews such as rawhides.